Anyone who has flown a budget airline knows the flight is often an experience to be endured rather than enjoyed. Straight-jacket seats, non-existent leg room, extra fees for carry-on luggage, minimal entertainment — and don’t even think about food. Enter KLM’s Flight Upgrader, a virtual reality experience that allows the budget traveler to enjoy the comforts of a KLM flight — without the cost. The free VR headsets were distributed to people waiting for budget flights at JFK airport. 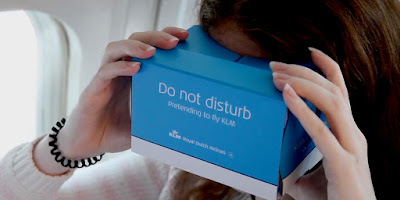 By downloading the app, they had a chance to (virtually) experience what they were missing: leg room, in-flight entertainment and a caring KLM flight crew serving an appetizing meal. Only one hitch with this promotion: its target audience was the price-conscious traveler who chose not to spend significantly more money for a more premium flight. Still, the idea of creating “flight envy” by contrasting a great (virtual) experience with an underwhelming actual experience is clever. And free in-flight entertainment is always welcome.